In today’s fast paced and constantly changing world feeling anxious from time to time is almost inevitable, and we have all experienced a transient feeling of anxiety at some point in our lives. This is normal and even useful sometimes! Anxiety can be a natural and healthy emotional response to certain situations. A feeling of anxiety may keep us safe from danger, by causing us to be alert to our surroundings so we can respond to a threat if needed, and it can help us to perform to the best of our ability in situations such as exams or tests. However, when overwhelming anxiety is starting to affect your ability to perform every day tasks, it may be time to speak to your Doctor. There’s a lot that can be done to help, once you take that first step. Anxiety refers to a feeling of worry, unease or dread about something (for example, a future event) with an uncertain outcome. It is a common, but very uncomfortable feeling, and one which we would prefer to avoid if possible. The first step in tackling anxiety is understanding how it feels in the body and mind. Anxiety: When Should It Stop? Many of us who experience anxiety in response to stressful situations find that this feeling leaves us when the situation that generated the worry is over. However, some people may find that their anxiety becomes difficult to control or overwhelming. Excessive, chronic, or debilitating anxiety that interferes with your daily life may be a sign of an Anxiety Disorder. Anxiety Disorders, along with Depression, represent the most common mental health concern affecting people across Britain and wider Europe. It is estimated that 1 in 9 people will suffer from an Anxiety Disorder in their lifetime. Anxiety Disorders may take many forms including Generalised Anxiety Disorder, Social Anxiety Disorder, Panic Disorder, Obsessive Compulsive Disorder, and Agoraphobia to name a few. 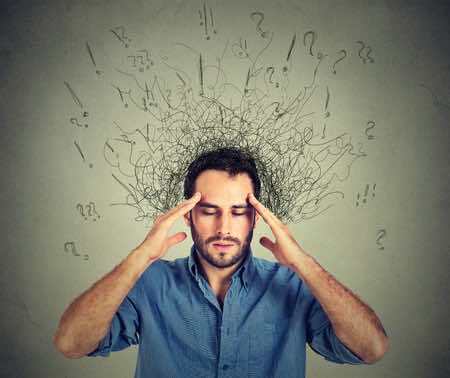 Of the Anxiety Disorders, Generalised Anxiety Disorder (GAD) is the most common one, and is characterised by strong feelings of worry about events or activities (real or imagined) that are irrational and difficult to control. People with an anxiety disorder may appear overly worried about everyday concerns such as their health or the health of their loved ones, finances, problems with the quality of their work, or a fear of a natural disaster or man-made attack. This worry will be present even when there is no obvious reason to be uneasy about such things. I’m Always Anxious, What Should I Do? If you think you or someone you know may be suffering from anxiety or even from an Anxiety Disorder there is no need to suffer in silence, as there are lots of options that can help! The first step is to tell someone about what you are experiencing, and your GP or a mental health professional is often a good place to start. At your appointment, your GP or other professional will want to know all about what you have been experiencing. Questions might explore the length of time you have been feeling anxious, the things that make you feel most worried, or how your anxious feelings make you feel in your body. You may be asked about your mood, and the impact that feeling anxious has on your quality of life. Your GP may examine you and do some medical tests to rule out illness as a cause of your anxiety. Based on this information, you and your chosen professional will work out a plan for dealing with your anxiety together. Often, the first choice for treatment is a form of talking therapy called Cognitive Behavioural therapy (CBT). This type of therapy uses techniques to help you identify and reframe certain thought patterns or beliefs about yourself or the world that may be contributing to your anxious feelings. Sometimes, people suffering from anxiety may choose to take medication along with CBT, and a common medication used to treat anxiety is a Selective Serotonin Re-uptake Inhibitor (SSRI). This medication works by increasing the amount of serotonin (a substance which contributes to feelings of well-being and happiness) in the body by preventing it’s reabsorption in the brain. In addition, many people find that regular aerobic exercise, such as brisk walking or jogging, is enough to reduce stress and control feelings of anxiety, as well as being great for your physical health. Changing your diet and stopping smoking and drinking alcohol may also help, as these substances may worsen anxiety. So, if you or someone you know is suffering from anxiety, maybe it’s time to speak to a GP about this, a service we offer at every LDC GP Surgery. Don’t let anxiety take over your life – take a stand and get some support! Book a GP appointment today!